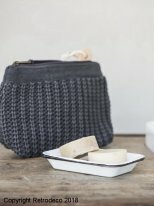 Small toilet kits to store everything in your handbag or in your suitcase. Whether you are looking for a vintage or a humorous spirit, you will love it. For women but also for men, it is a very good idea to make a small and useful gift.